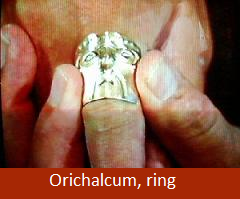 Orichalcum or aurichalcum is a metal mentioned in several ancient writings, including a story of Atlantis in the Critias dialogue, recorded by Plato. 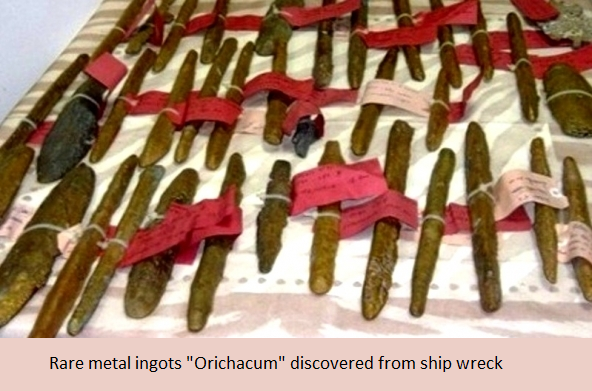 According to Critias, orichalcum was considered second only to gold in value, and was found and mined in many parts of Atlantis in ancient times. By the time of Critias, however, it was known only by name. 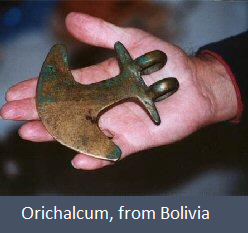 Today most scholars agree orichalcum is a brass-like alloy, which was made in antiquity by cementation. This process was achieved with the reaction of zinc ore, charcoal and copper metal in a crucible. Analysis has shown they are an alloy of copper, zinc, lead, iron and nickel. 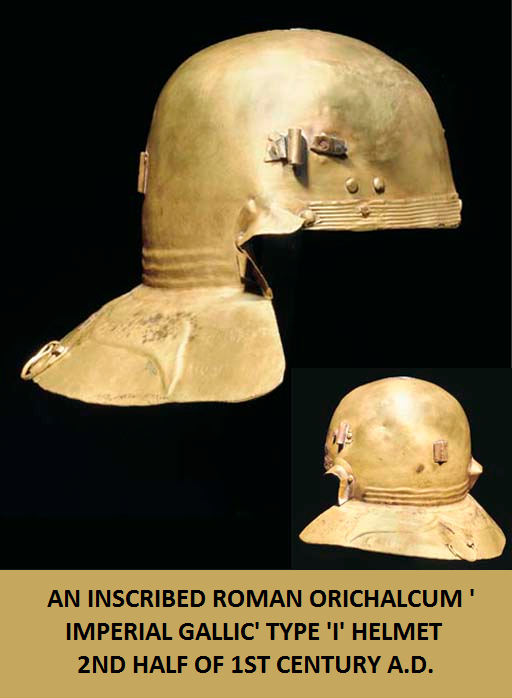 Orichalcum has been described as white or gold in color and also referred to as copper. 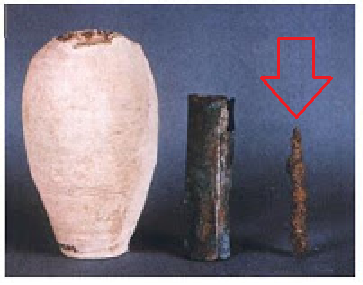 The combination of those metals found in the alloy in that wreck does not match the description of Atlantean orichalcum. There are many metal types including contaminated Bronze that has been labeled Orichalcumm so an exact formula if what Plato described is difficult for the novice to pin-point. This alloy was a product of metallurgy beyond the knowledge of the greeks at the time, and the methods kept secret on the metallurgist’s behalf. Orichalcum is first mentioned in the 7th century BC by Hesiod and in the Homeric hymn dedicated to Aphrodite, dated to the 630s. In Vergil‘s Aeneid it was mentioned that the breastplate of Turnus was “stiff with gold and white orachalc”. It is known from the writings of Cicero that the metal they called orichalcum, while it resembled gold in colour, had a much lower value. 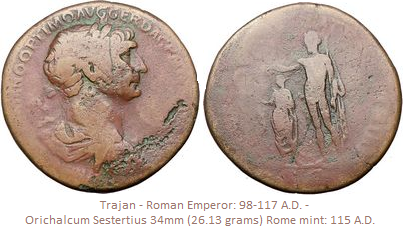 Orichalcum is also mentioned in the Antiquities of the Jews – Book VIII, sect. 88 by Josephus, who stated that the vessels in the Temple of Solomon were made of orichalcum (or a bronze that was like gold in beauty). 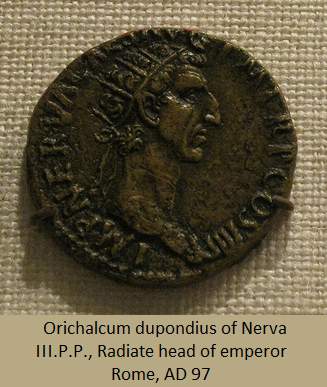 Pliny the Elder points out that the metal has lost currency due to the mines being exhausted. Pseudo-Aristotle in De mirabilibus auscultationibus describes orichalcum as a shining metal obtained during the smelting of copper with the addition of “calmia,” a kind of earth formerly found on the shores of the Black Sea.